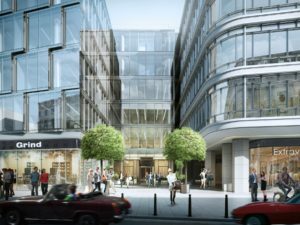 On October 19, representatives of investor Immobel Poland and the general contractor – Doraco Building Corporation Doraco topped the revitalized CEDET building in the center of Warsaw. The property, located at ul. Krucza 50, was not only modernized, but also expanded. The total area of the building, designed with the aim of prestigious offices and business premises will amount to approx. 22 000 sqm. The new installment of the investment will be commissioned around the end of the second quarter of 2018. 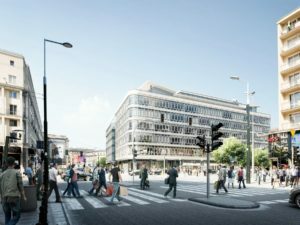 Originally built in the 50s of the twentieth century, the Central Department Store has been in the process of revitalisation since 2015 by Immobel Poland – a subsidiary of the Belgian real estate market leader – Immobel Group. The intention of the investor was to restore the building to its original character – a shopping space and meeting place for its inhabitants. Character that was lost during the careless and hasty reconstruction after a fire in 1975. Jacek Wachowicz, President of Immobel Poland said the company wants to pursue investments in revitalisation projects, despite the challenges. 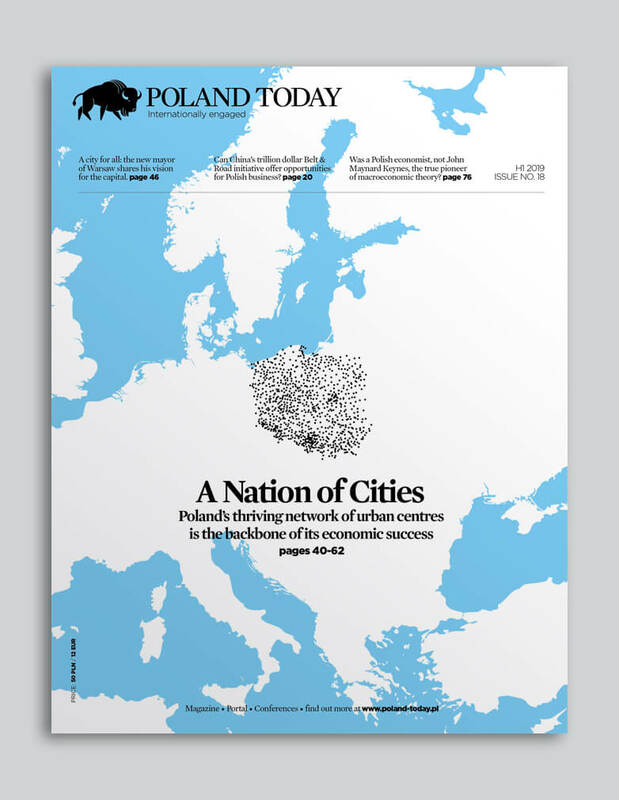 “Revitalisation is one of the trends, without which we do not ensure the sustainable development of urban centers. We see it well on European markets, where modernised pearls of architecture perfectly complement the offer of large, modern office buildings. The Warsaw market also matures. Modernised facilities are generally smaller and more intimate. It is an asset for those businesses that rely on the privacy and prestige of services – like law firms or investment funds,” said Wachowicz. Patrycja Van Triet, project manager at Immobel Poland emphasises that the building has been adapted to the needs of today’s inhabitants of Warsaw. “In addition to the revitalisation of the main body of the building, we extended it, creating a completely new surface. In the neighboring plot between the streets Krucza and Bracka, we reconstructed a western front on ul. Bracka. The new facility, designed by a consortium of recognised architects from AMC – Andrzej Chołdzyński and RKW Rhode Kellermann Wawrowsky, now has seven floors above ground and four underground. Office space, with a total area of approx. 15,000 sqm will be located on floors 2 to 6. In addition, retail outlets, the area of which the lease is over 7,000 sqm, are designed on level -1, ground floor and 1st floor. On the remaining floors, there will be an underground public car park with 136 parking places. Andżelika Cieślowska, President of Doraco noted that the implementation of CEDET, as with any revitalisation project, was also met with challenges. “Damage caused after the fire in 1975 and during subsequent renovations required us to be flexible in the approach of the investment schedule. We were ready to face such challenges, but we can never predict exactly what we will find when we enter the building. We had to do some extra work to stabilize the revitalised building. With such investments, we need to ensure the safety of future users of the building. Press release by Immobel Poland.